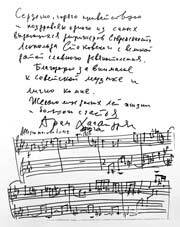 During his long and continuously innovative career, Leopold Stokowski wrote and received thousands of letters to and from many of the famous and also lesser-known of his contemporaries. 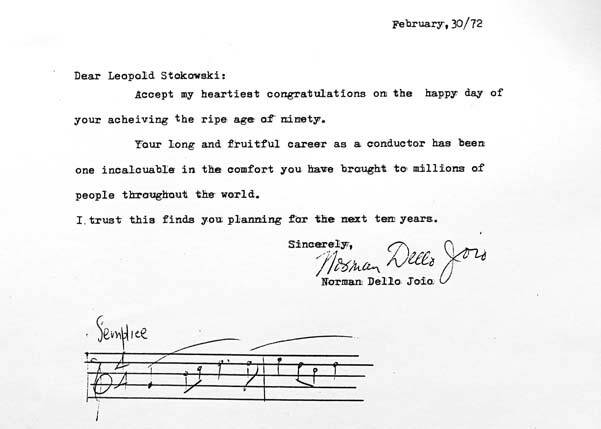 Particularly interesting are the many letters Leopold Stokowski received honouring his 90th birthday. 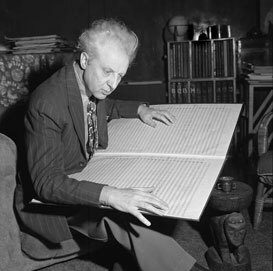 On 18 April 1972, Leopold Stokowski celebrated his 90th birthday and became one of the 20th century's oldest practitioners of the art of conducting. The actual day began with a rehearsal of Beethoven's Ninth Symphony at Carnegie Hall with the American Symphony Orchestra - one of several orchestral ensembles founded by Stokowski - and the evening was taken up with a celebratory birthday party at New York's Plaza Hotel. Among the many guests was Oliver Daniel (1911-1990), a long-time friend and professional associate who became Stokowski's biographer 1. 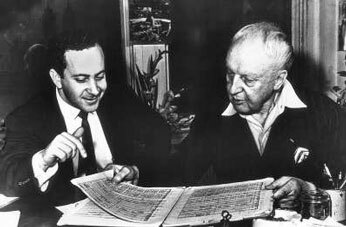 Together they had co-founded the Contemporary Music Society in New York and, in his capacity as a CBS producer, Daniel had overseen Stokowski's broadcasts in the "20th Century Concert Hall" series, both of them sharing a great desire to champion new music. "...Over three hundred friends and admirers gathered to make the evening a gala occasion... in order to summon the revellers to their tables, Stokowski's Assistant Conductor Ainslee Cox conducted three fanfares. Other fanfares were interspersed throughout the evening. They were Richard Arnell (England), Klaus Egge (Norway), Carlos Surinach (Spain), Josef Tal (Israel) and three Americans: Ross Lee Finney, Ulysses Kay, and Donald Lybbert. "...It all began splendidly... A fanfare sounded to welcome the guest of honour and Stokowski carefully strode to the dais and took his place among his children, grandchildren and his former wife Evangeline... There were tributes from many organization: Ulysses Kay, representing Broadcast Music Inc., presented him with a first edition of the Beethoven Ninth Symphony dated 1826. 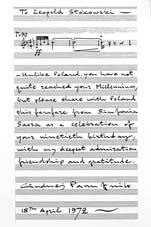 "...There were greetings from most of the musical organizations of the city, and one special gift that I had assembled was a collection of tributes, mostly musical, from over sixty composers, including Dmitri Shostakovich, Frank Martin, Carl Orff, Darius Milhaud, Leonard Bernstein, William Schuman, Alan Hovhaness, and more. 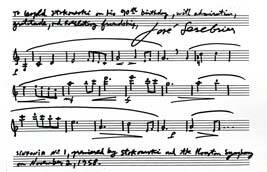 Lou Harrison wrote a Jahla in the Farm of a Ductia to Pleasure Leopold Stokowski on His Ninetieth Birthday. 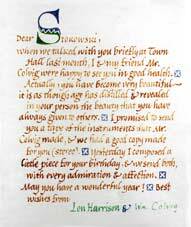 It was for harp and percussion, beautifully illuminated in the composer's superb calligraphy." Daniel relates that there were many letters and telegrams from various dignitaries unable to be present, including Richard Nixon and Nelson Rockefeller. However, while these were being read, "Stokowski stood, and with his right arm extended as if he were conducting, said he had had enough. He wanted no more tributes and we should get on with the music. Jorge Bolet obliged with a Chopin Ballade, Judith Raskin sang and William Masselos played from Schumann's Davidsbündlertänze... A Fanfare introduced the birthday cake and everyone sang 'Happy Birthday' as Stoki rose and conducted. Surrounded by his children and grandchildren, he seemed to be very happy. 'For me there are two great things in life,' he said. 'They are friendship and music'"
Now, we are sharing that "special gift" of the 90th birthday tributes which Oliver Daniel assembled from musicians the world over. Some, like Shostakovich had their works championed by Stokowski over the many decades of his career. 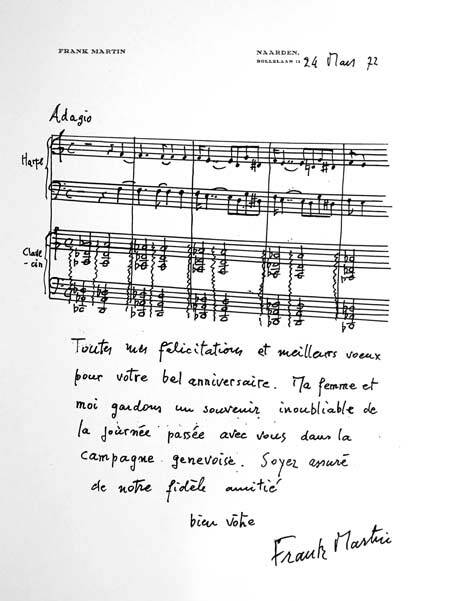 Others, less well-known perhaps, may have had just one of their works conducted by the Maestro on only one occasion, but even so - as their messages and greetings clearly show - they were heartily gladdened by the experience. 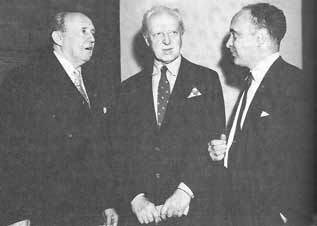 Roy Harris, left with Leopold Stokowski and Oliver Daniel, right in 1952. The largely self-trained US composer Roy Harris (1898-1979) was one of the composers performed regularly by Stokowski. Stokowski performed the fifth movement of the Harris Symphony no 4 "Folk Song Symphony" : Interlude: Dance Tunes several times during his All-American Youth Orchestra tour across the USA in the summer of 1941. He performed it in Indianapolis, Indiana on 10 June 1941 and again in Colorado Springs, Colorado on 19 June 1941. Stokowski and the All-American Youth Orchestra then recorded this Harris movement for American Columbia in 1941, not released by Columbia, but available in privately issued CDs. According to the fine Leopold Stokowski Discography and Concert Register of John Hunt 3, Stokowski also recorded the third movement of the Harris Symphony no 4: Interlude: Dance Tunes for Strings and Percussion with the New York Philharmonic on 12 October 1941, now available in privately released CDs. Stokowski later recorded Harris's Folk Rhythms of Today, adapted from his Symphony no 4 with the NBC Symphony on 19 December 1943. Conducting the Saint Louis Symphony in 1955, Stokowski performed the Harris Symphony no 7, which performance is available available on Guild Historical GHCD 2379/80: guildmusic.com 4. On 20 November 1936, Stokowski with the Philadelphia Orchestra gave the US premiere of the Tikhon Khrennikov Symphony no 1 of 1935 which was Khrennikov's student graduation work. 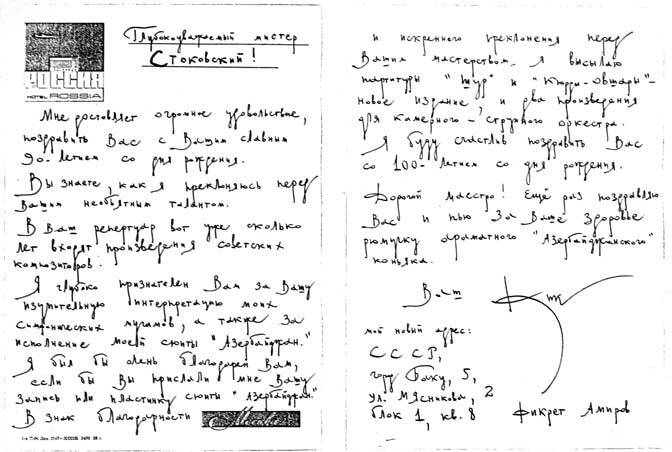 However, as Khrennikov emerged as General Secretary of the Union of Soviet Composers for four decades, and was the Stalinist suppressor of any Russian music deemed guilty of "formalism" or "modernism" 5; including Prokofiev, Shostakovich, Khachaturian and Schnittke 6, Stokowski seems not to have further performed Khrennikov's works. Stokowski performed Howard Hanson's Symphony no 4 'Requiem' (1943), which had just won the Pulitzer Prize, with the NBC Symphony 2 January 1944. The symphony gains its name from its dedication by Hanson "In Memory of my Beloved Father" and the movements having names from the requiem mass 21. This NBC performance is available on Guild Historical GHCD 2379/80. 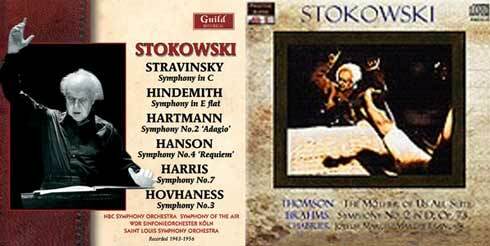 Stokowski also performed Hanson's Serenade for Flute, Harp and Strings (1945) with the New York Philharmonic on 26, 27 March 1949. This performance was included as CD NYP-9908 in the 10 CD New York Philharmonic Special Editions NYP 9904 24. 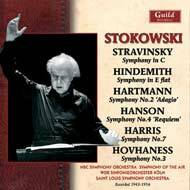 With the Minneapolis Symphony, Stokowski performed the Hanson Pastorale (1950) for oboe, harp and strings on 22 January 1954. With Rudolph Firkusny and the Houston Symphony, he performed Hanson's Piano Concerto (1948) on 22 November 1955. Stokowski performed Darius Milhaud's Symphony no 1 (1939) written in Paris just after the declaration of war between Germany and France. This performance was with the NBC Symphony 21 March 1943 after Milhaud had moved to California. A recording of the NBC performance is available on Guild Historical GHCD 2347. Stokowski performed four dances from Darius Milhaud's Saudades do Brasil (1921): no 2 Botafogo, no 4 Copacabana, no 5 Ipanema, no 6 Gavea with the NBC Symphony 14 April 1942, unissued then but now available on Guild Historical GHCD 2361. Stokowski also performed two of these dances: no 2 Botafogo and no 5 Ipanema with the New York Philharmonic on 2 January 1947, and with the Orquesta Sinfonica de Madrid 9 on May 1956. Also during a 6 June 1954 concert with the Südwestfunk Radio Orchestra, Stokowski performed Milhaud's Carnaval d'Aix (1926). Stokowski also performed a Milhaud's concerto on 18 September 1955 with the Pacific Coast Festival Orchestra. 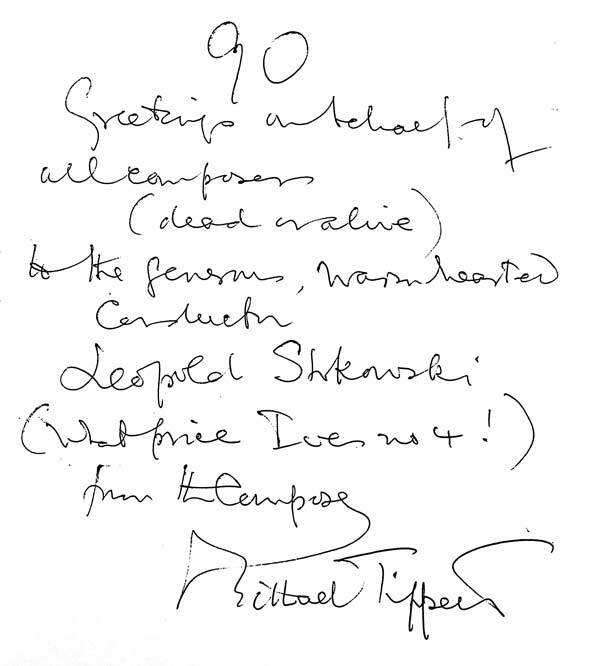 Sir Michael Tippett, like Stokowski trained at the Royal College of Music. Stokowski first conducted Tippett's music 5 November 1956 when he performed the "Ritual Dances" from The Midsummer Marriage (1954) with the Houston Symphony. 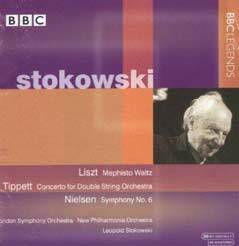 Stokowski then performed Tippett at his second concert of the 1961 Edinburgh Festival. Tippett wrote his Concerto for Double String Orchestra in 1939, one of his earlier works. 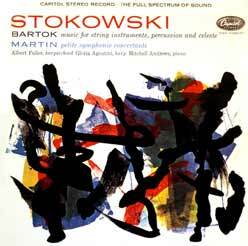 The distinctive rhythms and the interplay between the two string orchestras is a delight in Stokowski's 22 August 1961 performance of this work at the Edinburgh Festival, recorded with the London Symphony Orchestra with whom Stokowski at that time had a dedicated relationship. This great recording was released on CD by BBC Legends BBCL 4059-2, shown above. 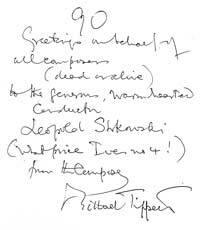 After this Edinburgh Festival performance, Tippett rushed on stage and kissed the Maestro's hand ! In the concerts of November 4 and 5, 1957, Stokowski gave the premiere of José Serebrier's Sinfonia no 1 with the Houston Symphony. Serebrier was then still a student of the Curtis Institute, Class of 1958. This 1957 performance is available on Guild Historical GHCD 2347. 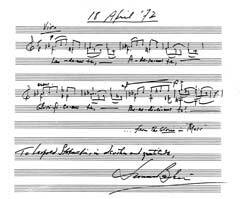 Stokowski and the American Symphony Orchestra gave the premiere of José Serebrier's Poema elegiaca on 7 October 1963, the work having been commissioned by the orchestra. 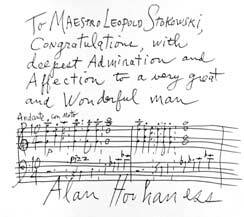 Stokowski performed Alan Hovhaness's early Exile Symphony - Symphony no 1 (1936) with the NBC Symphony on 6 December 1942. 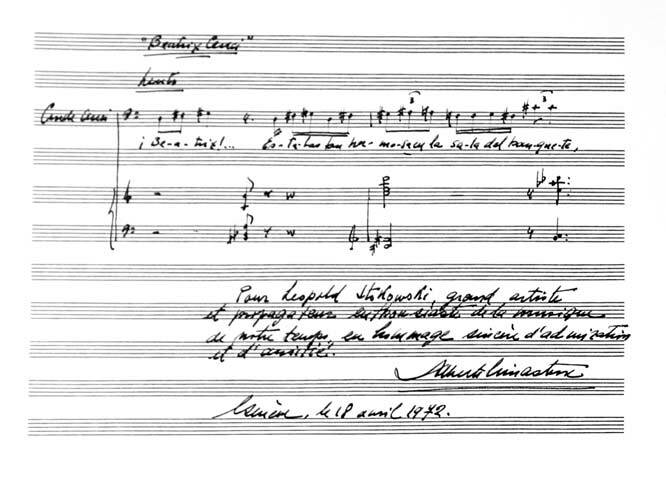 This has been cited as "...the first performance by a major American orchestra of a work by the composer..."7. This 1942 performance is available on Guild Historical GHCD 2347. Stokowski performed the Hovhaness Vision from a High Rock (1954) for percussion, harp, celeste, and strings with the Detroit Symphony on 17 February 1955. 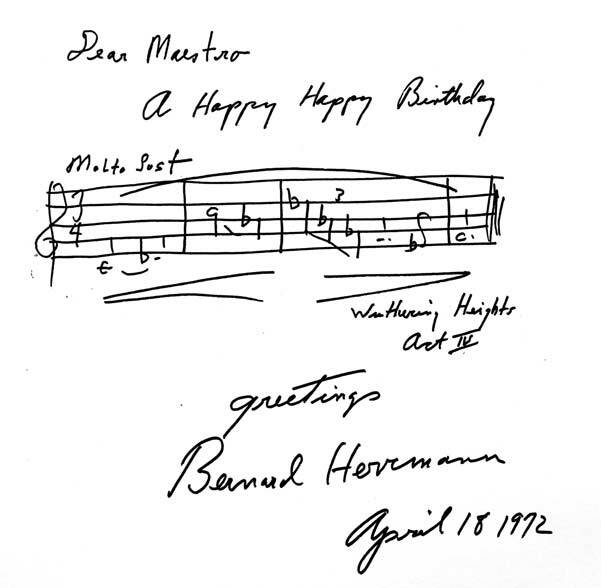 Stokowski gave the premiere of Hovhaness's Symphony no 2 "Mysterious Mountain" during his opening Houston Symphony concert, beginning his tenure as Music Director of that orchestra on 31 October 1955. This symphony then went on to become one of Hovhaness's most popular works. 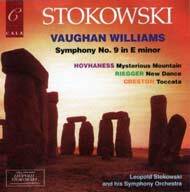 Stokowski again performed and recorded the Symphony no 2 "Mysterious Mountain" with the Leopold Stokowski Symphony Orchestra in New York City 25 September 1958, which was issued on CALA CACD 0539. .
Leopold Stokowski again pioneered the music of Alan Hovhaness, giving the premiere of his Symphony no 3 (1956) with the Symphony of the Air in Carnegie Hall on 4 October 1956. This 1956 performance is available on Guild Historical GHCD 2379/80. 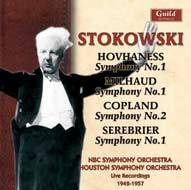 Stokowski also conducted the Hovhaness As On The Night, a "Christmas Ode" with the Houston Symphony on 17 December 1956. 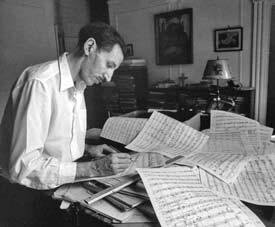 In the Autumn of 1958 with the Contemporary Music Society of Houston, Stokowski performed Alan Hovhaness's Meditation on Demeter opus 170 19, scored for piccolo, English horn, alto saxophone, flügelhorn, tuba, and percussion. 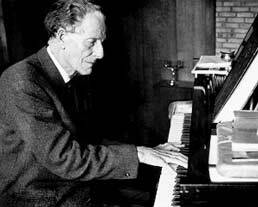 On 28 March 1963, Stokowski performed the Hovhaness Symphony no 15 with his American Symphony Orchestra. With the Boston Symphony, he performed Prelude and Quadruple Fugue (1936 revised 1954) on March 6, 7, 9, 10, 1964 and at the Tanglewood Festival concerts that summer. In 1972, Stokowski returned to Saint Bartholomew's Church in Manhattan, where he had been organist 64 years previously (although in a previous structure) to perform works for orchestra and chorus. 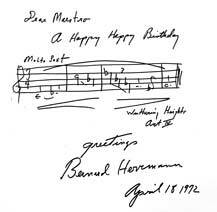 One was of Hovhaness's Magnificat performed at Saint Bartholomew 16 April 1972 20, just 2 days before his 90th Birthday celebration, and one of Stokowski's last performances in the United States. 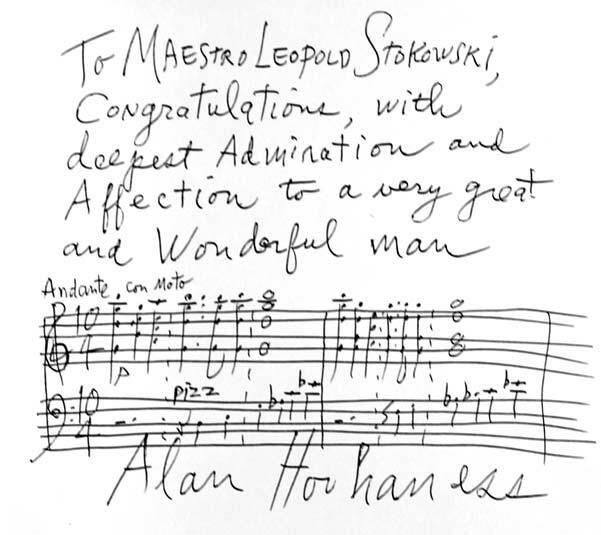 In 1956, Alan Hovhaness wrote to Oliver Daniel about his appreciation of Leopold Stokowski's contribution to "the new age in music" 22. 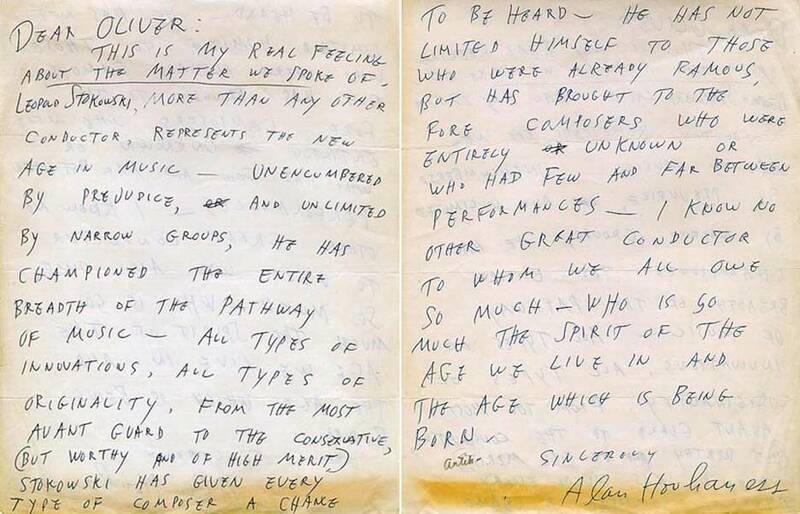 Click on the image below to see Hovhaness's original letter (the text is also shown at the foot of this page). Leopold Stokowski performed what was likely the second US performance of Carl Orff's Carmina Burana with the Boston University Symphony and Chorus in Boston on November 19, 1954, and New York at a Carnegie Hall concert on November 21, 1954 23, six months after the San Francisco premiere. Although the first performance of Carmina Burana was in Frankfurt in 1937, the published score was not available in the USA until 1953. Stokowski then performed Carmina Burana with the RAI Roma Orchestra on 30 April 1955, and with the Hollywood Bowl Symphony on 30 August 1955. 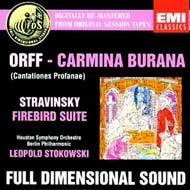 With his Houston Symphony, Stokowski first performed Carmina Burana on 7 April 1958, followed by a famous recording - Capital SP 8470 - on 9-13 April 1958. 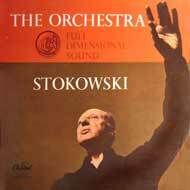 Stokowski further performed the work with the Philharmonia Orchestra in a London concert of 18 June 1961. At least two performances of Carmina Burana with the American Symphony exist: a rehearsal of 7 May 1966 and a performance of 18 May 1969. He also performed Orff's Midsummer Night's Dream Incidental Music in a staged version at the Empire State Music Festival 90 miles from New York City played by the Symphony of the Air on 19 July 1956. He performed Orff's Trionfo di Afrodite cantata scored for a very large orchestra (e.g. 6 horns, 12 percussion plus timpani, 3 harps, 3 guitars, 3 pianos, etc.) with the Houston Symphony 2 April 1956. 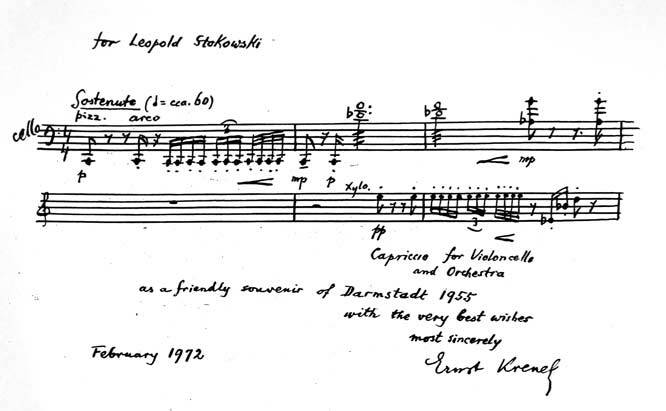 On 11 November 1957, Stokowski performed Orff's Nänie und Dithyrambe which had just been composed; perhaps Stokowski obtained the score from Carl Orff the previous May during his visit to Germany. 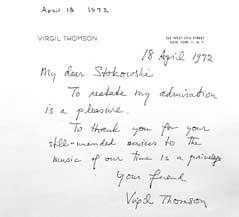 Stokowski frequently performed Virgil Thomson The Seine At Night, first with the New York Philharmonic on 21 March 1948 and six later 1948 New York Philharmonic concerts. Thomson said The Seine At Night was a memory of his view of the Seine from the Pont des Arts, during his extended living in Paris 1925-1940. It was dedicated both to Paris and to his boyhood Kansas City, Missouri, and it is this Kansas City memory which is the subject of Thomson's Three Pictures: Wheat Field at Noon (1948) performed by the New York Philharmonic on 26 March 1949. 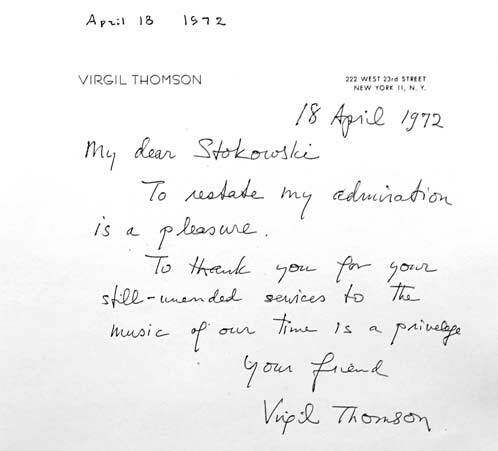 Stokowski introduced the Suite from Virgil Thompson's opera The Mother of Us All in New York Philharmonic concerts of 30, 31 March and 2 April 1950. The latter performance is available on Pristine Classics release PASC215 (see image above). Fikret Amirov developed what he called "symphonic mugam" based on Azerbaijan folk melodies. Stokowski conducted Fikret Amirov's symphonic mugam Kyurd ovshary (1948) with the Houston Symphony 16 March 1959, and recorded it two days later on Everest SDBR 3032 (33 RPM) coupled with the Scriabin Poem of Ecstasy. He also performed Amirov's Azertaijan Suite of 1950 with the New York Philharmonic - at his concert return to that orchestra for the first time since April, 1950 - on 3-6 March 1960. This performance is being prepared for release on Guild Historical GHCD 2415 (see below). 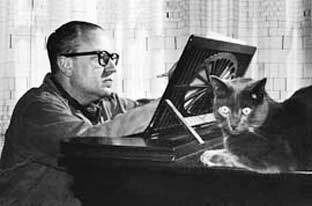 In a European tour in May, 1955, Stokowski performed Alberto Ginastera's Variaciones Concertantes opus 23, a 1953 work for chamber orchestra, and probably Ginastera's most popular work. 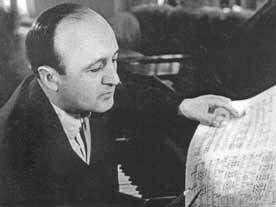 He programmed Variaciones Concertantes again with his American Symphony on 25 February 1963. Stokowski also conducted Ginastera's Obertura para el Fausto criollo. Samuel Barber was frequent in Stokowski's programming, particularly outside the US. 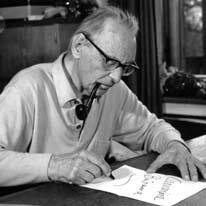 He introduced Barber's Medea Suite, adapted by his ballet in 1947, with the New York Philharmonic on 3 April 1948. 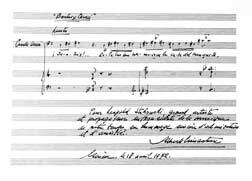 Barber's Adagio for Strings, adapted in 1936 from his earlier string quartet was performed for television with the BBC Symphony 9 June 1951, followed by Concertgebouw Orchestra on 5 July 1951. Stokowski made a well-known recording of the Adagio with 'His Symphony Orchestra' (primarily musicians from the Symphony of the Air) in New York City 22 January 1957. issued by Capital Records as SAL-8385, and in several later LP and CD formats. Stokowski also recorded the Adagio for Strings with the USSR Large Radio Symphony on 7 June 1958, issued on Music & Arts CD-787. Also with the American Symphony in concerts in 1968, 1969, and 1970. 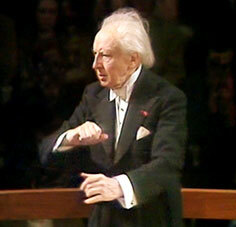 Stokowski performed Barber's Intermezzo from Act 3 of his opera Vanessa with the Houston Symphony on 17 March 1958. In the Autumn of 1958 with the Contemporary Music Society of Houston, Stokowski performed Samuel Barber's Dover Beach 19, a setting of Matthew Arnold’s poem for baritone and strings which Barber had composed in 1931, at age 20. Stokowski with Jaime Laredo and the American Symphony, performed the Barber Violin Concerto in New York City on 6 April 1964. Stokowski and the American Symphony also performed two Barber rarities: the Mutations From Bach, a short piece for brass and timpani on 7 October 1968, and "Die Natali" Chorale Preludes for Christmas performed appropriately on 18 December 1965. Stokowski performed Carlos Chavez's Toccata with the Houston Symphony on 18 March 1957. Stokowski gave the first performance of a work by Morton Gould by a major orchestra in January 2, 1936 with the Philadelphia Orchestra: the Chorale and Fugue in Jazz which had been written the previous year. Stokowski performed Morton Gould's Guaracho from his Latin-American Symphonette - the Symphonette no 4 (1940) in Salt Lake City, Utah with the All-American Youth Orchestra on 21 June 1941, and again in four other California concerts that month. 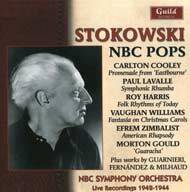 Stokowski performed Guaracho with the NBC Symphony on 15 November 1942 now available on Guild Historical GHCD 2361. 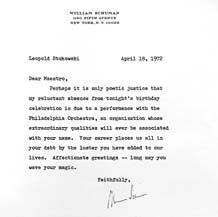 Stokowski again performed Guaracho two decades later with the Philadelphia Orchestra on 17 December 1962. Also the Gould New China March and Red Cavalry March NBC Symphony on 14 March 1943. These marches were were issued on CALA CACD 0526. 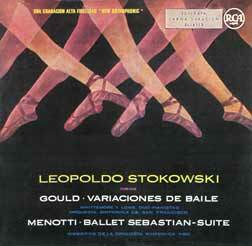 On 22 November 1953, Stokowski made a very successful recording of the Gould Dance Variations for Two Pianos & Orchestra with Arthur Whittemore and Jack Lowe duo-pianists and the San Francisco Symphony on Victor LM-1858 (33 RPM), a recording available in a fine restoration by Mark Obert-Thorn from Andrew Rose's Pristine Classical on PASC 274. 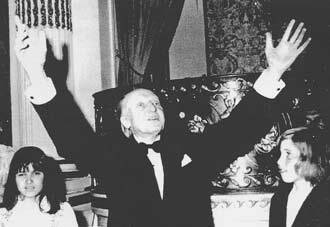 Stokowski performed Morton Gould's Latin American Symphonette: II Tango with the Orquesta Sinfonica de Madrid 9 on May 1956. Stokowski performed music from one of Gian Carlo Menotti's earliest works with the New York Philharmonic on 15 January 1949: Island God: Two Interludes. This was Gian Carlo Menotti's 1942 one act opera in three scenes with the interludes separating. Menotti said "This orchestral performance of the interludes may well be called the New York premiere, since when they were performed at the Metropolitan [Opera] the audience indulged in its usual habit of conversation while the curtain was down..." 12. Stokowski also recorded a suite of 7 sections from Menotti's 1944 ballet Sebastian with the NBC Symphony in September, 1954. This is Stokowski's first commercial stereophonic recording, some 32 years after his pioneering experimental stereophonic recordings with the Philadelphia Orchestra recorded by Bell Laboratories (see 1932 Stokowski - Bell Laboratories Stereophonic Recordings ). This beautiful recording, one of RCA Victor's first stereo recordings, and was issued initially with Morton Gould's Dance Variations on Victor LM-1858, a monophonic disc (see image above). This was followed by LP and CD stereophonic releases in later years, such as RCA ARL 1-2715 (33 RPM) see below. Stokowski also performed Menotti's Piano Concerto (1945) - which Menotti referred to as his first purely instrumental composition 15 - with Rudolf Firkusny and the New York Philharmonic in concerts of 20, 21 January 1949. 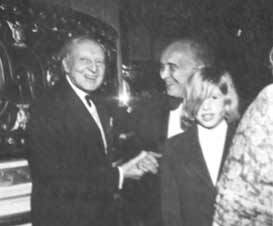 Stokowski again programmed the Piano Concerto in Houston on 23 March 1959 with the ten-year old pianist Francesca "Kiki" Bernasconi, whom Stokowski had met in Naples, Italy 14. Kiki Bernasconi later appeared with several US regional orchestras, on TV as a prodigy, before apparently disappearing from sight (professionally). Stokowski performed Norman Dello Goio's Concert Music for Orchestra (1944) with the New York Philharmonic on 14 March 1948. With the New York Philharmonic, Stokowski performed William Schuman's American Festival Overture (1939), having a large fugal development of American themes as its central section, on 18, 19 March 1948. 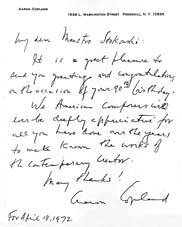 Two decades later, he performed the American Festival Overture with his American Symphony Orchestra on 28 March 1963. Stokowski performed Aram Khachaturian's Symphony no 2 "Symphony With Bells" inspired by World War 2 8 with the New York Philharmonic on 24 September 1948. 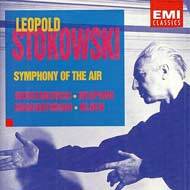 This symphony Stokowski again recorded with the Symphony of the Air on 18 December 1958, issued on United Artists UAS 8001 (33 RPM) and later on CD by EMI 98555. Also Masquerade Suite with the New York Philharmonic recorded for American Columbia in November 1947 on M 729 (78 RPM) and Columbia ML 4071 (33 RPM). This recording was issued on CALA CACD 0534. 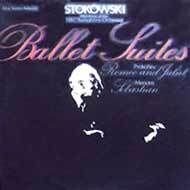 Stokowski performed both the Suite no 1 and excerpts from Suite no 3 from the ballet Gayaneh (1942). 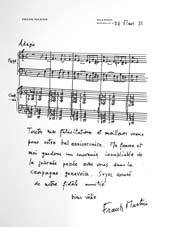 Suite no 1 was performed with the New York Philharmonic 24, 25 March 1949. Lezghinka from Gayaneh and Sabre Dance from Gayaneh were performed in Philadelphia Orchestra concerts of 21 June 1965 and 14 October 1966 respectively. 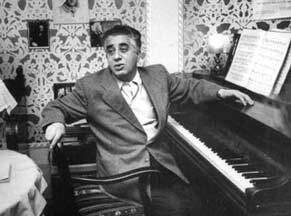 Stokowski programmed Khachaturian's Russian Fantasy (1945), a short work of 6 minutes, with a prominent part for piano, performed with the New York Philharmonic 1, 2, 6 April 1948. 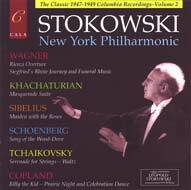 Stokowski performed Khachaturian's Festive Poem with the Houston Symphony on 28 November 1955. Stokowski performed the Khachaturian Symphony no 3 with the Chicago Symphony on 15, 16 February 1969, followed by a famous RCA recording LSC 3067 (33 RPM) in Symphony Hall, Chicago. Stokowski also performed the Khachaturian Flute Concerto with Jean-Pierre Rampal and the American Symphony 18, 19 January 1970. Stokowski conducted Ned Rorem's Eagles (1958) with the Boston Symphony on 6, 7, 9, 10 March 1964 followed by a 21 September 1964 Tanglewood concert. 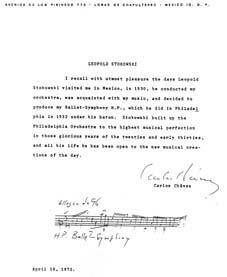 Rorem was impressed that Stokowski conducted Eagles as a normal repertoire piece, did not require a premiere, did not contact Rorem, but simply programmed the work 10, Stokowski also conducted Rorem's Pilgrims for Strings on March 1, 1972. 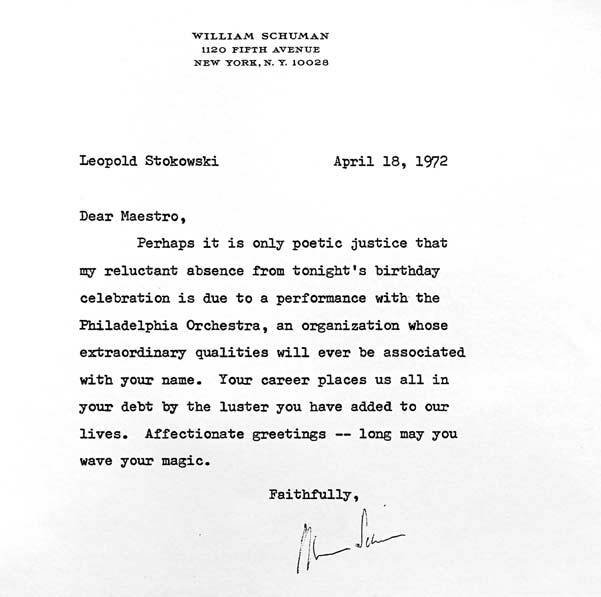 Rorem wrote of that performance: "...Now Stokowski is a great man...but I don't like Pilgrims anymore. My contention: the worse a piece is, the worse it will sound the better it's played..." 10. Leopold Stokowski was active in the pioneering of the orchestral music of Aaron Copland. Stokowski gave the premiere of Copland's Short Symphony (1933) with the NBC Symphony on 9 January 1944. A recording of this performance was unpublished at the time, but is now available on Guild Historical GHCD 2347. Stokowski conducted two of the seven movements of Aaron Copland's Billy the Kid: 3 - Prairie Night and 5 - Celebration Dance with the New York Philharmonic on 25 October 1947 and during three 1948 concerts. Following the 25 October 1947 concert, Stokowski and the New York Philharmonic recorded the Copland Billy the Kid 2 movements on Columbia X-729 (78 RPM), now available on Cala CACD 0534. Stokowski also performed and recorded Copland's Quite City (1941) with musicians of the Hollywood Bowl Symphony on 6 August 1946. The work is scored for trumpet, English horn, and a string orchestra. Stokowski introduced a suite from the Hollywood film score for The Red Pony (1948) at the New York Philharmonic concerts of 13, 14 October 1949, of which there are privately issued recordings. 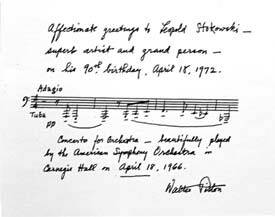 Stokowski also performed Quiet City with his own American Symphony on 9, 10 March 1969. During a concert of 10 October 1965, the American Symphony also played Copland's Variations for Orchestra orchestrated in 1957 from his earlier Piano Variations. Frank Martin was one of the composers whom Stokowski recorded during his cooperation with Capital Records. In December, 1957 with 'His Symphony Orchestra', Stokowski recorded Martin's Petite symphonie Concertante (1945), issued on Capital SP 8507 (see more below). 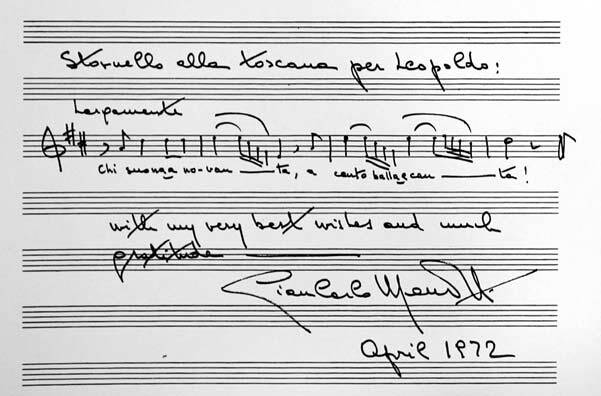 With the advent of stereo, Stokowski signed with Capital Records and produced a series of "Full Dimensional Sound" LPs which fully exploited the new medium, as in his superbly played 1957 recording of Frank Martin's Petite Symphonie Concertante (the opening bars of its Adagio are shown in the composer's tribute letter above). Other music by living composers which he recorded for this label included Carl Orff's Carmina Burana, a stunning performance and recording of Shostakovich's 11th Symphony with the Houston Symphony Orchestra, Samuel Barber's Adagio for Strings, short works by Harold Farberman, Vincent Persichetti, and Theodore Berger's delightfully sprightly Rondino Giocoso. 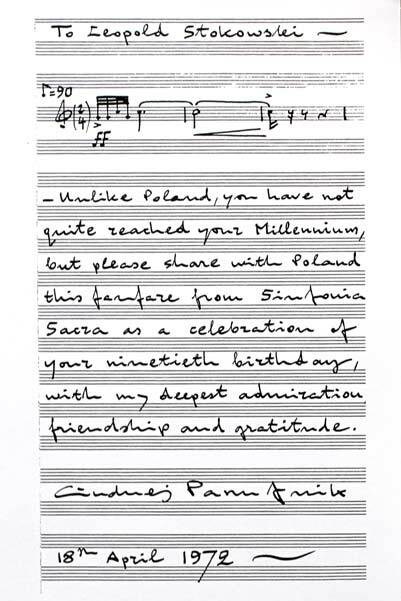 Stokowski performed Andzej Panufnik's Tragic Overture (1942), Panufnik's evocation of the World War 2 Poland experience, with the New York Philharmonic 24, 25 March 1949. The Overture has extensive percussion, but no timpani nor oboe. 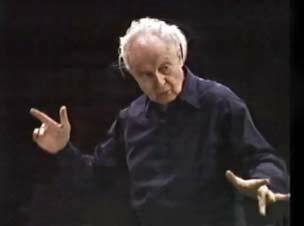 Then with the Detroit Philharmonic, Stokowski performed the Panufnik 1951 Symphony of Peace 17 February 1955. 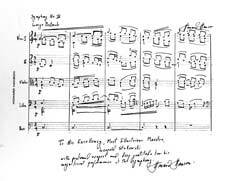 This symphony was later discarded and parts incorporated into Panufnik's Sinfonia Elegiaca - Symphony No. 2 of 1957. 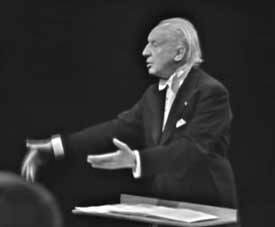 9 Stokowski performed and recorded Panufnik's Universal Prayer twice on Unicorn recorded 5 September 1970 and in a BBC television performance 20 June 1971. Stokowski performed Bernard Herrmann's The Devil & Daniel Webster with the New York Philharmonic 10, 11, 13 February 1949. The 13 February 1949 performance was included as CD NYP-9908 in the 10 CD New York Philharmonic Special Editions set NYP 9904 25. 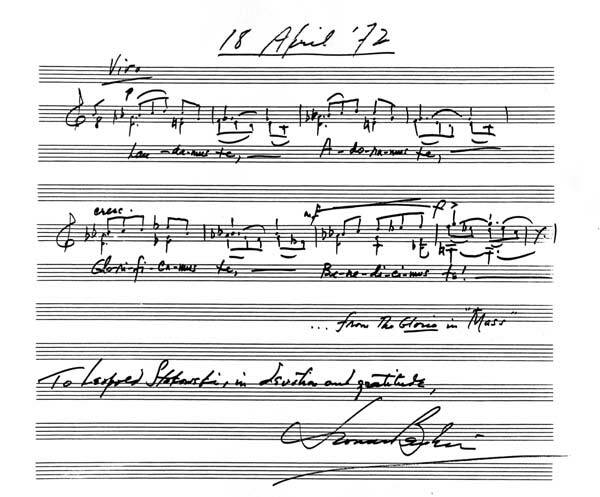 Also Herrmann's Berceuse for the Fallen 5 January 1954 with the National Symphony of Washington DC. Stokowski performed the Ernst Krenek Cello Concerto during a German radio broadcast with the Hessischer Rundfunk orchestra on 31 May 1955 and with Gunter Von Aue and the Houston Symphony on 11 November 1957. Leopold Stokowski regularly programmed the music of Lou Harrison over a thirty year period. He recorded Harrison's Suite for Violin, Piano and Small Orchestra with violin Anahid Ajemin and her pianist sister Maro Ajemin and 'His Symphony Orchestra' for Composers Recordings CRI 114 (LP) on 29 October 1952 - now available on NAXOS 9.80675. (Anahid and Maro Ajemin were pioneers in the music of Lou Harrison, Alan Hovhaness, John Cage and other contemporary composers.) For an American Composers Alliance concert at the Museum of Modern Art in New York City, on February 22, 1952, Stokowski programmed Lou Harrison's Canticle no 3 (1940) 18, a work featuring flute, guitar, and percussion which was performed by leading New York sessions musicians. In the Autumn of 1958 with the Contemporary Music Society of Houston, Stokowski performed Lou Harrison's Nokturno for violins, violas and cellos 19, which had been published that year. 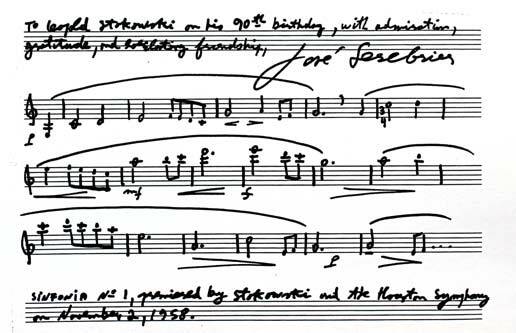 As mentioned above, for Stokowski's 90th Birthday Tribute, Lou Harrison wrote Jahla in the Farm of a Ductia to Pleasure Leopold Stokowski on His Ninetieth Birthday scored for guitar, harp, percussion and harpsichord, which was performed during the occasion. 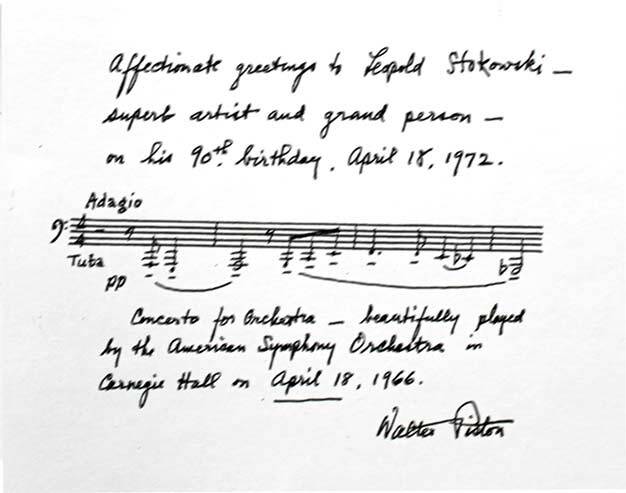 Stokowski was an early champion of Walter Piston, performing the Suite for Orchestra with the Philadelphia Orchestra as early as 1 April 1932. He performed the Concerto for Orchestra with the American Symphony on 18 April 1966. Click here to read the Edward Johnson article on Stokowski and Vaughan Williams . 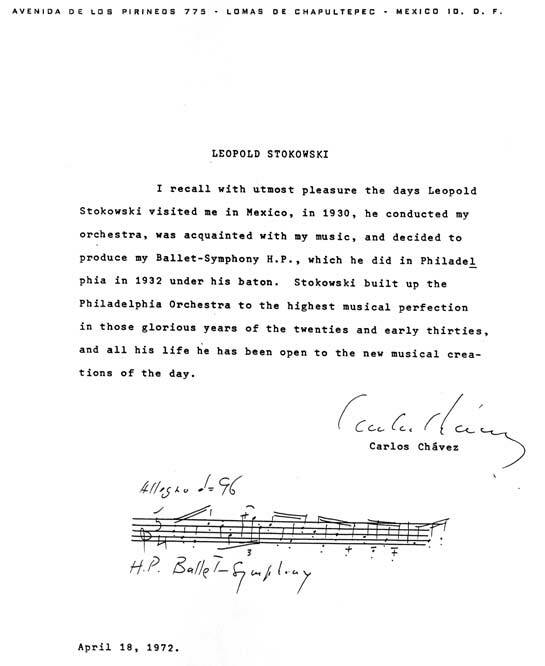 Click here to read the Edward Johnson article on Leopold Stokowski Letters . Click here to read the Edward Johnson article on Stokowski's Return to Britain . 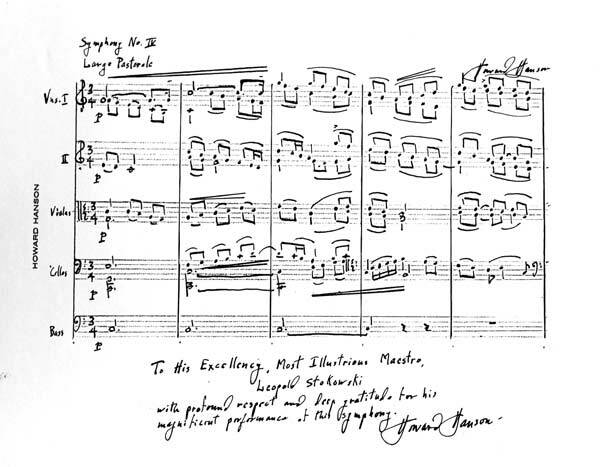 Click here to read the James H. North article on Stokowski and "His Symphony Orchestra"
Click here to go to the Home Page of stokowski.org . Edward Johnson is a widely recognized musical scholar and expert on Leopold Stokowski. Benefitting from his extensive musical archives and those of his friends and fellow scholars, Edward Johnson has been instrumental in creating the superb series of Stokowski restorations on the Cala CD label. 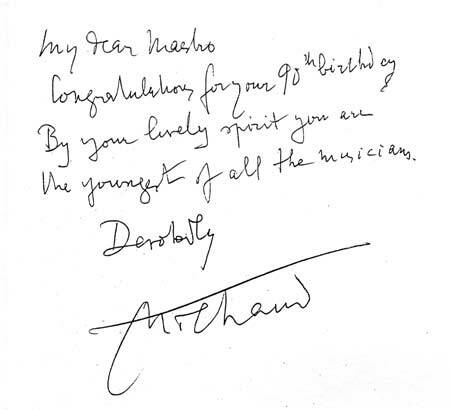 "Dear Maestro, On this auspicious day of your 90th birthday I am happy to salute you and to express one again my admiration for your enormous talent. 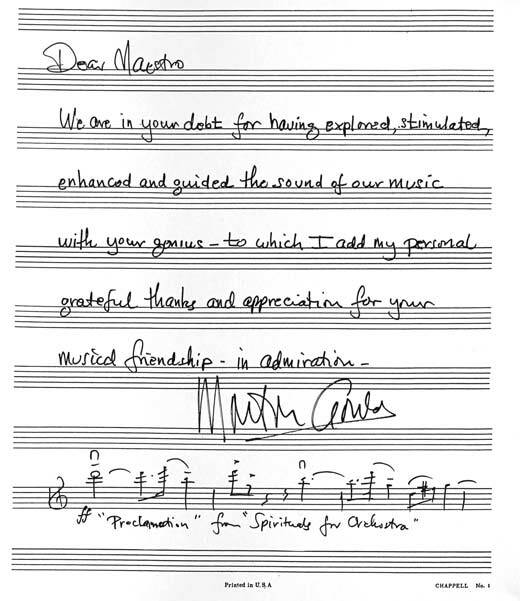 Like many other lovers of music throughout the globe, I am grateful to you for the joy that your wondrous art brings. In our country you are known and loved as an inspired artist, encounters with whom are unforgettable for everyone. 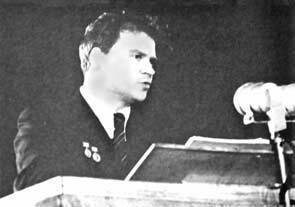 Soviet composers see in your person and old and loyal friend who had made an enormous contribution towards the popularization of our music. I shall always preserve gratitude in my heart for the inspired interpretation of my compositions. 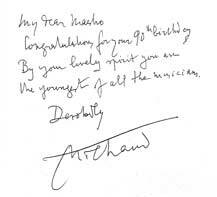 I wish you health and creative energy." 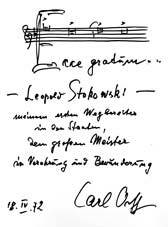 Caption to the composer's musical autograph: "To dear Leopold Stokowski with my very best wishes. D. Shostakovich." 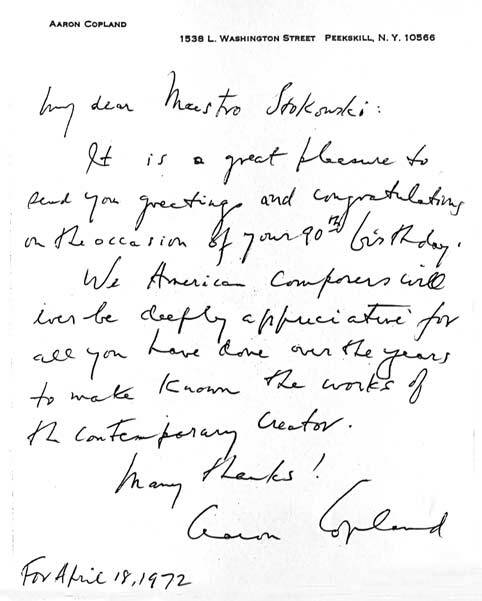 "Deeply respected Mr. Stokowski, It gives me enormous pleasure to congratulate you on your glorious 90th birthday. You know how much I admire your immense talent. 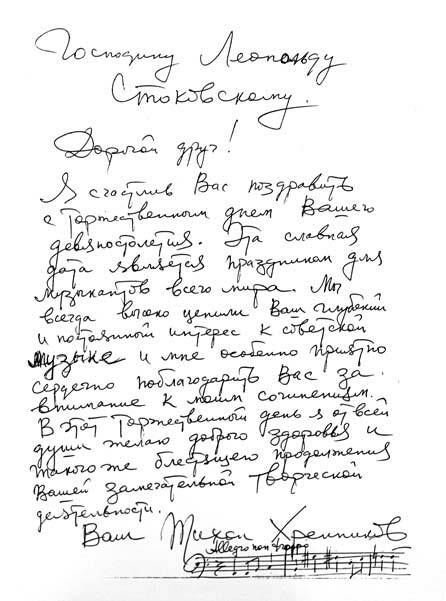 How many years have already passed since you included Soviet composers in you repertoire. I am deeply grateful to you for your stunning interpretation of my Symphonic Mugams and also for the performance of my Suite Azerbaijan. I would be very grateful to you if you could send me your recording or an LP of the Azerbaijan Suite. 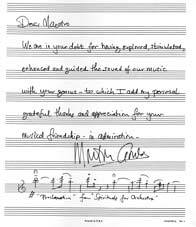 As a token of my gratitude and sincere mastery, I am sending you the scores of Shur and Kyurdi-ovshary - in the new edition, and two works for small string orchestra. 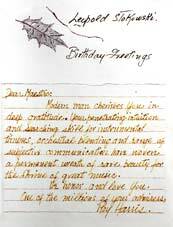 I shall be happy to send my congratulations on your hundredth birthday. 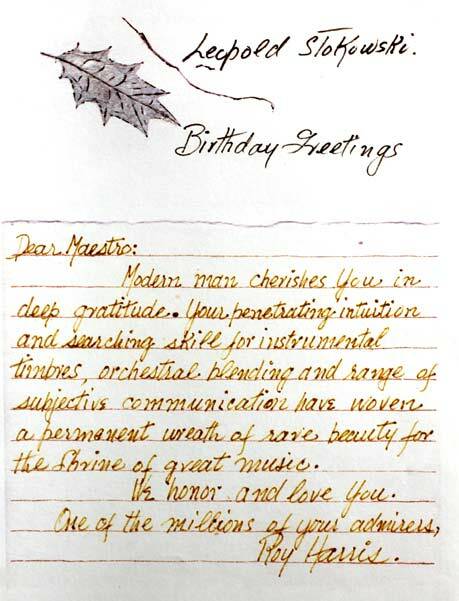 Dear maestro! Once again I congratulate you and I drink a little glass of sweet-scented 'Azerbaijan' cognac to your health." 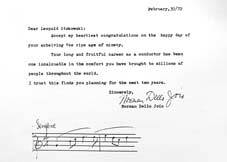 "I cordially and warmly salute and congratulate on of the most outstanding conductors of our time, Leopold Stokowski, on the great day of his glorious ninetieth birthday. 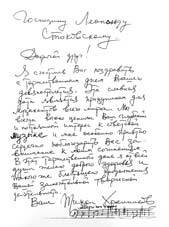 Thank you for your consideration towards Soviet music and to me personally. I wish you yet more years of life and great happiness." I am happy to congratulate you on the festive day of your ninetieth birthday. This glorious date is a celebration for musicians throughout the entire world. 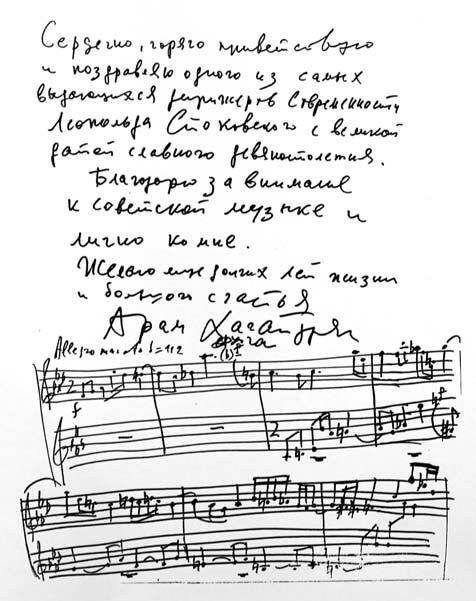 We have always appreciated highly your profound and constant interest in Soviet music and it is especially pleasant for me to thank you cordially for the consideration shown to my works. On this festive day with all my soul I wish you good health and the same brilliant continuation of your remarkable creative work." "Ecce gratum ['Behold the welcome' from Carmina Burana] - Leopold Stokowski! - my first pioneer in the States, the Great Master - in respect and admiration." 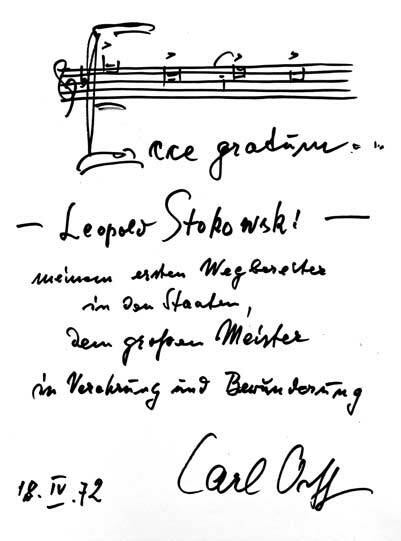 "For Leopold Stokowski, great artist and enthusiastic propagator of the music of our time, in sincere homage of admiration and friendship." "All my congratulations and best wishes for your beautiful anniversary. My wife and I retain an unforgettable memory of a day spent with you in the Geneva countryside. Be assured of our faithful friendship." This is my real feeling about the matter we spoke of. Leopold Stokowski, more than any other conductor, represents the new age in music - unencumbered by musical prejudice, and unlimited by narrow groups, he has championed the entire breadth of the pathway of new music - all types of innovations, all types of originality, from the most avant guard [sic] to the conservative (but worthy and of high merit). Stokowski has given every type of composer a chance to be heard - he has not limited himself to those who were already famous, but has brought to the fore composers who were entirely unknown or who had few and far between performances. 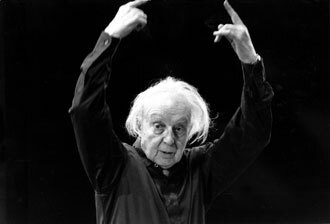 I know no other great conductor to whom we all owe so much - who is so much the spirit of the age we live in and the age which is being born. Click here to read the Edward Johnson article on Leopold Stokowski and British Music . 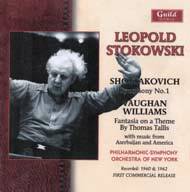 Click here to read the Edward Johnson article on Leopold Stokowski and Ralph Vaughan Williams. 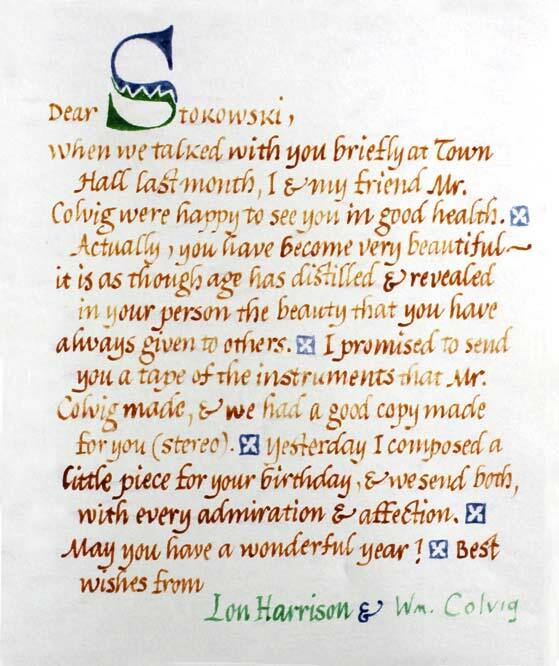 Click here to read the Edward Johnson article on letters from famous composers to Leopold Stokowski. Click here to read the Edward Johnson article on Leopold Stokowski's Return to Britain. 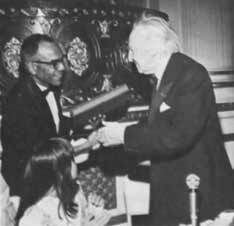 2 In this photograph, Leopold Stokowski is attending his 90th Birthday Party at the Plaza Hotel, New York City on 18 April 1972. With him are two of his grandchildren; Laila deVitre at left, by his daughter Luba, and Seth Goldsmith at right by his daughter Sadja. 3 Hunt, John. Leopold Stokowski. Discography. Concert register. Published by John Hunt. 1996. ISBN: 0-952827-5-9. Updated in 2006 by John Hunt ISBN: 978-1-901395-19-8. 5 pages 117-139. Lobanova, M.. He Was Chosen By The Time: The Phenomenon of Tikhon Khrennikov Slavic Musicological Studies, Volume 13. H. Schmalenberg. Berlin. 1998. 6 pages 3-16. Gojowy, Detlef. Shostakovich and the Avantgarde. Neue Berlinische Muzikzeitung Volume 2. 1955. 7 Simmons, Walter. Alan Hovahness Exile Symphony. Fanfare Magazine. Tenafly, New Jersey. June 7, 2012. 8 Yuzefovich, Victor. Aram Khachaturyan. Sphinx Press. New York, New York. 1985. ISBN 0-8236-8658-2. 9 Jacobson, Bernard. A Polish Renaissance. Phaidon Press. London, UK. 1996. ISBN 0-7148-3251-0. 10 Rorem, Ned. 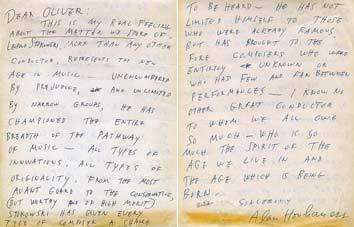 The Later Diaries of Ned Rorem: 1961-1972. Open Road Media. New York, New York. 2007. ISBN-13: 9781480427723. 11 quotation from Sixsmith, Martin. 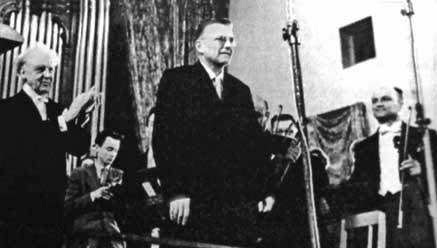 Shostakovich: The Secret Rebel. The Guardian. London, UK. 14 July 2006. 12 Menotti quote page 7. New York Philharmonic Program Notes. New York, New York. 15, 16 January 1949. 13 pages 870-874. Daniel, Oliver. op. cit. 14 pages 693-694. Daniel, Oliver. op. cit. 15 Menotti quote page 6. New York Philharmonic Program Notes. New York, New York. 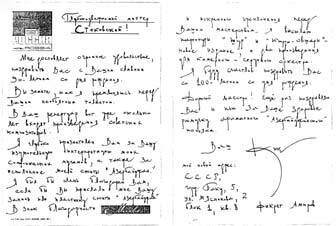 20, 21 January 1949. 18 pages 576-578. Daniel, Oliver. op. cit. 19 pages 694-695. Daniel, Oliver. op. cit. 20 page 116. Smith, Rollin. Stokowski and the Organ. Pendragon Press. 2004. ISBN 157647103-9. 21 Watanabe, Ruth. 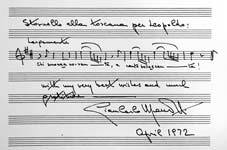 Howard Hanson's Manuscript Scores. University of Rochester Library Bulletin Volume V no 2. University of Rochester. Rochester, New York. Winter 1950. 22 courtesy of the Rare Book & Manuscript Collection Library, Libraries of the University of Pennsylvania. Philadelphia, Pennsylvania. 23 page 12. Boston University . Concord Enterprise. Concord, Massachusetts. November 25, 1954. 24 page 69. North, James H. New York Philharmonic. The Authorized Recordings 1917-2005. A Discography. The Scarecrow Press. Lanham, Maryland. 2006. ISBN-13 978-0-8108-5854-1. 24 page 67. North, James H. New York Philharmonic. The Authorized Recordings 1917-2005. A Discography. op.cit.